The Sacré-Coeur Catholic basilica was built in 1875 and was finished in 1919 at the top of the Montmartre hill in Paris. The architect Abadie was inspired by the Romano-Byzantine style. The domes, elongated into ovoid forms, the 80-metre bell-tower from which the 19-tons Savoyarde bell can be heard, the whiteness of this monument which overlooks the whole of Paris, henceforth makes it one of the major landmarks of the Paris scenery. 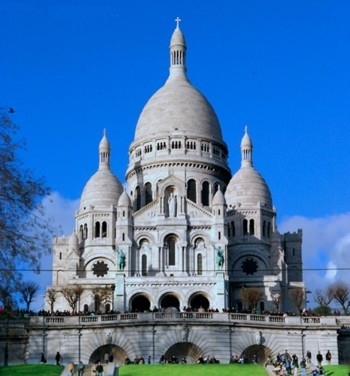 The Sacré-Coeur is a holy place and a flagship of Catholic devotion to the Holy Virgin in Paris. It attracts many pilgrims from all over the world and has a large network of affiliated churches.